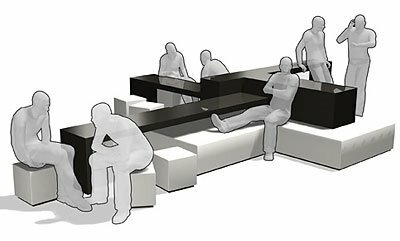 The German office furniture manufacturer Rohde & Grahl worked with Dutch design firm Peppermind (who recently changed their name to Crystallize – allround design) to create Meta-Fora, a furniture concept designed to encourage interaction by providing a meeting point for different situations. The purposely informal setting is a great way to spur casual conversations between employees, or as a place to hold small meetings. Visit the Rohde & Grahl website – here.